number the regions 0..31 in the "obvious" way so that set A consists of the regions whose index has bit 0 set, set B consists of those whose index has bit 1 set, etc. That is: set A=1, B=2, C=4, D=8, E=16; and then e.g. 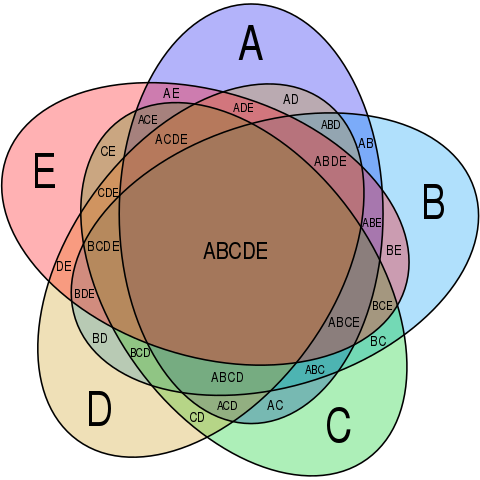 the region labelled ACDE gets the number A+C+D+E=1+4+8+16=29. Thus we number the regions with the numbers from 0 (for the external region, not part of any of the sets) to 31 (for the central region, part of them all) consecutively. fix it up by hand, swapping entries n and n+16 to adjust the sum for set E until it too has sum 248. We can do this in various ways; I picked this one: 24, 25, 27, 26, 30, 7, 5, 4, 12, 13, 15, 14, 10, 11, 9, 8, 0, 1, 3, 2, 6, 31, 29, 28, 20, 21, 23, 22, 18, 19, 17, 16.